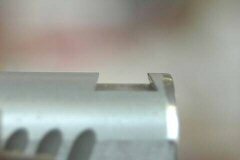 One of the more advanced procedures I perform to my guns is to cut a front sight dovetail, and of course, install the corresponding sight. I purchased a 1911 .45 ACP slide that didn't have a front sight so I decided to install a fiber-optic front sight. Since the slide did not come with any front sight cuts I had to mill the dovetail. 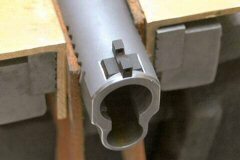 This sight required a 65o x 0.330” width x 0.075” depth dovetail. Before milling the dovetail, I had to make sure the slide was mounted exactly perpendicular to the cross-slide table of the mill and perfectly level so the sight would be straight. First, I squared my swivel vise. 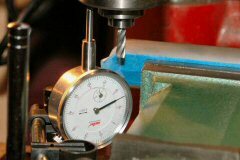 I rotated the vise until the dial indicator read 0.000” across the fixed face of the vise. Next, I installed the slide in the vise using a parallel. I put blue tape on the sides to protect the slide while clamped in the vise. I ran my dial indicator across the top of the slide to ensure it was perfectly level. When I cut a dovetail slot I cut out the center of the slot first with a square end mill, then cut the angles with the dovetail cutter. This is called a pilot slot. 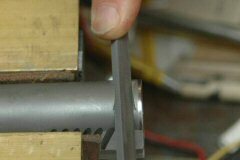 The dovetail cutter is made of high speed steel (HSS) so it is best not to load up the teeth by using it to cut the entire dovetail. Ok, now it is time for some higher math. Well, this worked out to be 0.26” which is a hair over 1/4”. Since I had a 1/4“ carbide end mill this is what I used to make the initial cut. Now I needed to know where to position the center of the end mill. 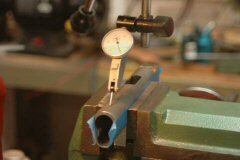 I took my calipers and measured the length of the sight, which was 0.5”. Since the base was in the center of the sight, the midpoint was 0.25”. I installed the 1/4” end mill bit in my mill. 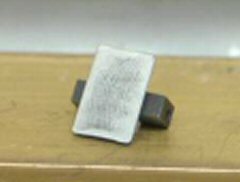 I used a 0.010” feeler gauge and moved the front of the slide until it was 0.010” away from the bit. I set up the travel indicator and moved the piece 0.010” (thickness of feeler gauge) + 0.25” (distance to middle of sight dovetail) + 0.125” (half the thickness of the bit). I added an additional 0.005” so the sight would be back from the edge of the slide just a bit. So I moved the bit a total of 0.010” + 0.25” + 0.125” + 0.005” = 0.39”. I had now correctly positioned the bit to cut the pilot slot. Since the depth of the sight dovetail was 0.075” I adjusted my depth of cut to 0.075” below the top of the slide. 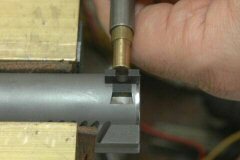 First, I positioned the slide under the center of the bit, and then using a 0.010” feeler gauge moved the bit down until it was touching the gauge. I positioned the travel indicator so the point was on the bottom of the spindle. 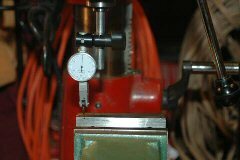 Then, I adjusted the depth of the spindle down 0.010” (thickness of feeler gauge) + 0.075” (depth of sight dovetail). Notice in the photo above the dial indicator reads 0.085”. Ok, so now I was ready to cut the pilot slot. 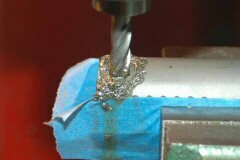 I was using a carbide bit so I set the spindle speed to 1500 RPM, but I didn’t want to break my bit so I moved the cross-slide table fairly slowly and used plenty of cutting oil. I replaced the square end mill with a 65o x 0.330” HSS dovetail cutter. 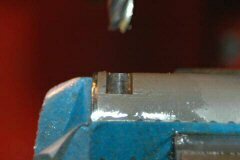 I positioned the work and lowered the bit so one tooth was touching the bottom of the pilot slot, then locked the spindle shaft at that depth. The instructions for the bit say to never go above 700 RPM, so I set the spindle speed to 540 RPM. Again using plenty of cutting oil, I made a slow single pass to finish cutting the dovetail. I cleaned off all the cutting oil from the slide by spraying thoroughly with brake parts cleaner. The front sight had a raised lip all around the underside of the base so I set a piece of 600 grit paper on a flat surface and rubbed the bottom of the sight until it was flat. I took my sight base file and carefully filed the rear of the dovetail cut in the slide until the sight would slide on easily about 1/4 of the way into the dovetail. I took only 3 or 4 light strokes with the file then tried the sight. 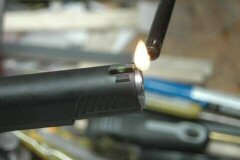 Once I got the sight started, I set it in place with a brass punch. To complete the sight installation I removed the sight, cleaned the sight base and dovetail with Acetone, then put a drop of green Loctite 609 on the dovetail and re-installed the sight. The Loctite ensures the sight stays in place. Here I am tapping in the front sight. I used a brass punch so I wouldn't mar the sight. I used regular bore copper cleaner to clean off the brass residue. Here is the completed front sight installation. Nice and clean, and the sight fits tightly in the dovetail. This sight will never come off during shooting. Now I needed to install the colored optic fiber rod into the front sight. I had a choice of two colors, red or green. I have never liked red sights because they seem to disappear into the background, so I chose the green rod. I cut the green rod and inserted it into the hole in the sight leaving a bit exposed on each end. I took a cigarette lighter and heated each end until it ballooned thereby locking the rod into the sight. In the photo above the slide has been parkerized. I installed the fiber optic rod after I finished the slide. That green fiber optic rod really gathers the light and helps me with quick target acquisition. The first time I used this gun in a match I had no misses. Not bad for a kitchen table gunsmith.